The word “affirmation” is the act of affirming. It implies conviction based on evidence, experience, or devotion. In Sufi Islam, there are three types of certainties: (a) knowledge of certainty, (b) eye of certainty, and (c) truth of certainty. 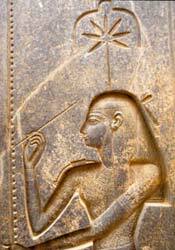 In Nuwaubu, these three certainties are compared to the three great realities: (a) Atum-Re, (b) Atun-Re, and (c) Amun-Re. The latter i.e., truth of certainty is a sophisticated form of knowledge (also called knowledge by presence) that builds upon the uplifting nature of knowledge itself; and ultimately one arrives at the truth of things through direct participation in the ultimate reality (i.e., Pa Temt-ta). In short, one must learn to defy gravity that is from Rizqyian to Etherian. "...We have bestowed upon him a mercy from ourself, and have taught him a knowledge from our own presence" (Quraan 18:65). The above surah and ayah of the Quraan carries a mathematical significance relating to the word NUWAUPU (= 117). In other words, the product 18 x 65 = 1170. It is an extension of the value 117. This message is dedicated to the goddesses (Netertaat) who guide my pen. What does it mean to be Rizqyian? What does it mean to be Etherian? The Nuwaupian learns from the book entitled Man From Planet Rizq that the Rizqyian is a physical being. In other words, a Rizqyian exists on this side of hydrogen. It appears that their main concern is advancement near Etherians i.e. energy or light beings. The main concern of the Etherians is the intellect. The word "Etherian" comes from the Greek word aither, fr. aithein, "to ignite." Fire on this side of hydrogen has its etheric correspondence. And fire and ether need some type of substance to burn. Fire burns upward. Ether burns to uplift. Fire, when it burns, has both a de-structive and purifying nature on this side of hydrogen (Atom). On the other hand, Ether, when it burns, has both an in-structive and moral nature on the side of Ether (Atum). As the Rizqyian moves from being physical to energy or from matter to ether and back again the process is known as perspiration. How would one know what ether is if he or she has not been instructed or edified by it? How would one know what fire is if he or she has not been consumed by it? Last edited by Pa Neter Ra; at 03:44 PM..